Book Marathon 2014 - Join the Effort! ~ The Toronto Hare Krishna Temple! Book Marathon 2014 - Join the Effort! At the Hare Krishna Centre, the month of December is a busy one, as we celebrate our annual Srila Prabhupada Marathon - a collective effort by Hare Krishna temples around the world to share the knowledge of ‘Bhagavad-Gita’ and other spiritual books with public in a grand way. 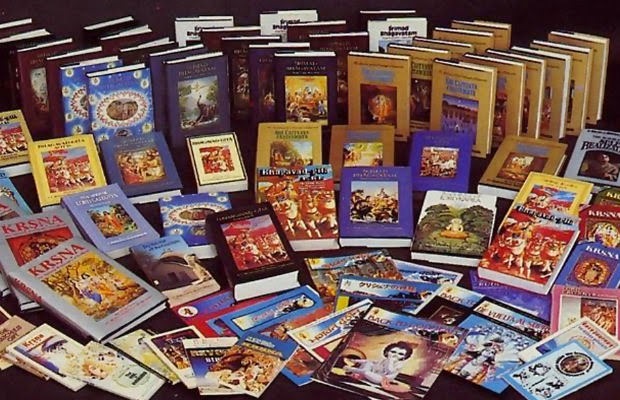 To-date, over five hundred million pieces of Vedic literature have been distributed around the world by ISKCON. There are many ways for you to get involved! The Gift of Knowledge - "Sastra Dana"
Taking this instruction to heart, your Toronto Hare Krishna Centre has been distributing tens of thousands of these spiritual books, including a whopping 50,000 last year, and hopes for another 50,000 in 2014. Many of these books are placed in hospitals, hotels, community centres, immigration centres, waiting rooms and other publicly accessible spaces through the generous donations of our community. Thus, we are asking for your help with “Sastra Dana” or sharing of knowledge, by sponsoring Bhagavad-Gitas or even other Vedic texts. For example, sponsoring 108 hard-bound Bhagavad-Gitas is $1,080, 108 soft-bound Gitas is only $540, and 108 other smaller Vedic books is $216. You can give as much as your heart desires. Srimad Bhagavatam and Caitanya Caritamrta Full Sets on Sale! December is typically a time to give and receive gifts and there is no better time to give your family a set of Srimad Bhagavatam or what is called the ripened fruit of all Vedic literature. The complete Srimad Bhagavatam set contains 12 cantos in a beautiful 18 volume hardbound set. We brought in a large shipment, and in order to share this gift, it is being offered at a discounted price of $299, or around only $16 a book! This is the last few weeks that it will be offered at $299 (or $29 per month on a payment plan! ), before the price likely increases to better reflect the actual cost and shipping. Please reserve your copy now before we are sold out! The Srimad Bhagavatam sets are also available in Hindi, Tamil, Bengali, Gujarati, and many other languages. If you already have the Srimad Bhagavatam, we don’t want to leave you out! We are making the entire 9 volume Caitanya Caritamrta available for $129, or just around $14 per book! Please reserve your set and make Srila Prabhupada’s desire come through that every respectable person should have a full set at home. Please drop by the “Bring Auspiciousness Home” table at Sunday Feast, contact toronto.sankirtan@gmail.com or call 1-888-412-7088 to reserve your set from the limited inventory.